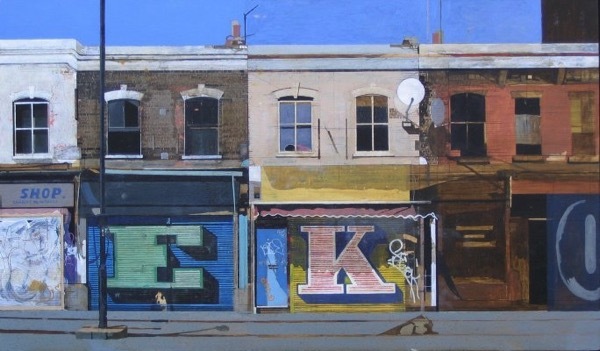 Recently, I met with the artist James Mackinnon (born 1968) whose streetscapes of the East End in general and London Fields in particular have captivated me for years. The seductive sense of atmosphere and magical sense of possibility in these pictures is matched by the breathtaking accomplishment of their painterly execution to powerful effect. Remarkably, James is a third generation artist, with his uncle Blake and grandfather Hugh before him – which perhaps accounts for the classical nature of his technique even if his sensibility is undeniably contemporary. We sat outside Christ Church, Spitalfields and chatted about the enduring allure of the East End for artists. I was sorry learn that James has been forced to leave due to a combination of the rising rents and lack of recognition for his work. Like several others I have met while researching my book, he is an artist who is genuinely deserving of appreciation by a much wider audience. 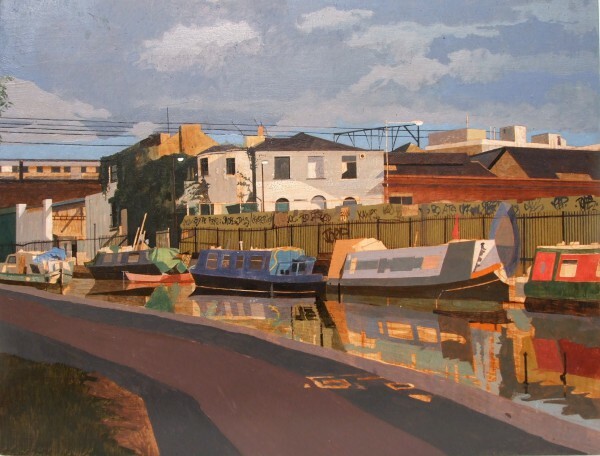 It is very disappointing that the rewards for such a prodigiously talented painter as James Mackinnon are so little that he can no longer afford to be in the East End, and the East End is lesser for it. “I grew up in South London in Lee Green and I used to go to the Isle of Dogs through the foot tunnel under the Thames and I was mystified by the area north of the river. Sometimes I would bunk off school with a sketchbook and go wandering there. It seemed a mysterious land, so I thought ‘What’s further up from the Isle of Dogs?’ I was a kid and I had been taken up to the West End, but I had never been to the East End and I sensed there was something extraordinary over that way. I had always loved drawing and I got a scholarship in art to Dulwich College when I was eleven. The art department was wonderful and I got massive support, so I used be in the art block most of the time. Later on, having left home and gone through college, there was a big recession and it was tough, all the students were scrabbling around for work, I had an epiphany. I was sat next to the Thames and I realised I just wanted to look at buildings and paint them. Since I was a child, buildings and their atmosphere, the feeling of buildings always had this resonance that I could not put my finger on. As a kid, I was painting with poster paint and drawing with felt tips, and I was obsessed with the Post Office Tower. There was an art deco Odeon in Deptford that was derelict for years and it was demolished at the end of the eighties, and that had a huge effect on me. I sat in the back of my dad’s car and we drove past on the way up to London, and I would see this building and almost have a heart attack, I had such strong feelings about it. My God this thing is extraordinary, I am in love with it! It was falling to bits, it had pigeons sitting in the roof and it had wonderful art deco streamlining but it had this atmosphere, an elegance and a sadness. Even with the Post Office Tower, I felt it had this presence as though it were a person. That comes to the fore when you paint and you feel the place. You are not just concentrating on the architecture, it’s an emotional thing. So with painting and drawing skills, I wanted to explore the landscape and often the hinterland. There is something compelling about going to a place you do not really know about – the mysterious world of places. The atmosphere of places is borne out of people and their residue, it’s about people living in a place. By exploring, I was slowly drawn to where my heart was guiding me. 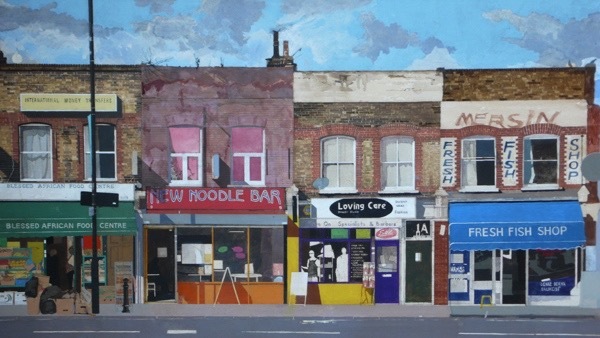 In the early nineties, I moved to the East End because it was affordable and I had always wanted to explore there. And I was there until around 2013. 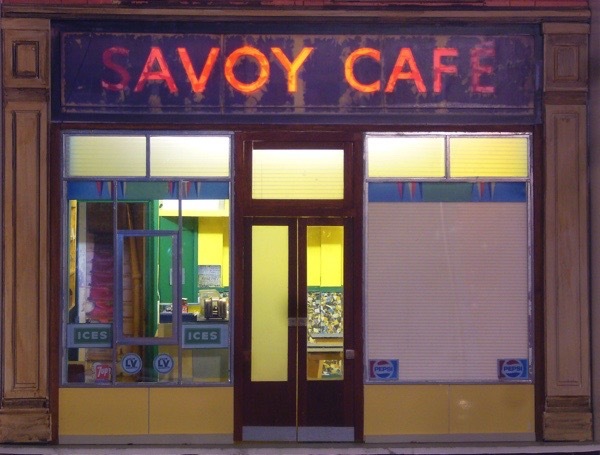 I lived in Hackney and had a great time there, and made some great friends. I was struggling as an artist, there was a lot of signing on the dole, but it was an act of faith, I knew it was what I had to do. 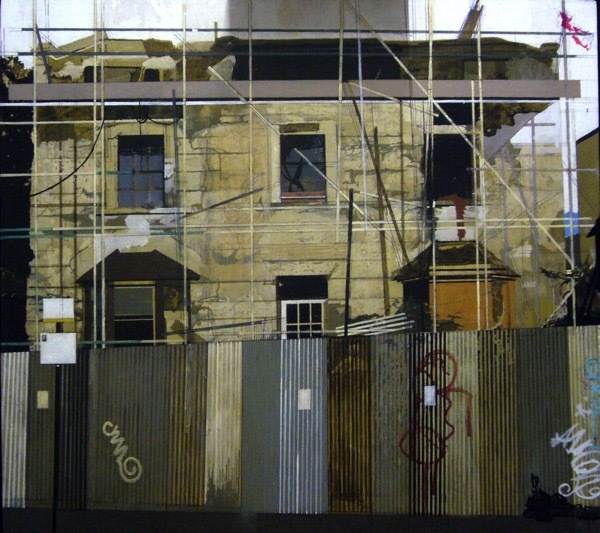 I had always painted buildings. I lived near London Fields and there is this little terrace of Georgian houses with a railway line and overhead electric wires, and there are some tower blocks in the distance, and you have all this grass. That was at the bottom of my road, it was such an interesting juxtaposition. A lot of East London landscapes have that, you might get a church sitting next to a railway line, next to tower block, next to the canal and a bit of old railing and some graffiti. That funny mixture. So I would just go and paint what I wanted. I painted what I was drawn to. For a long time, I was obsessed with Stratford. No-one had done anything to it at that time and I would go round the back streets and I roamed the hinterlands. I walked through to Plaistow and it is all part of a certain landscape that you find in the East End. To make a picture, you have got to find something that moves you and it can be something at the bottom of your road that resonates for you and makes the right composition for a painting. It’s hard to explain. I had a go at having a studio but I was always a struggling artist so, when it came to rent day, it got tricky. It’s lovely having a studio but I could not afford it. I tried living in my studio for a bit to save money on the rent but the landlord found out and there was a cat and mouse game. By the time I left, I think I had found myself. There is something in the painting that says it is me rather than anyone else and that has evolved from having done it for twenty years. I just about managed to survive. I realised I have got the tenacity and self belief. This is what I love. You find your path after a lot of struggle but it only comes by doing it. You realise that a great painting can come from something very ordinary, you can go for a walk and there might be something round the corner that knocks you out. There was a lot of that in the East End and I am still obsessed by it though it is changing hugely. Some of the landscapes have changed and some of the shops have gone. I miss Hackney in many ways but I do not miss struggling and rents going up. The area has changed. Beautiful work, graphic yet expressive, and lovely use of light. What a talented artist, and so sad that he awaits recognition. 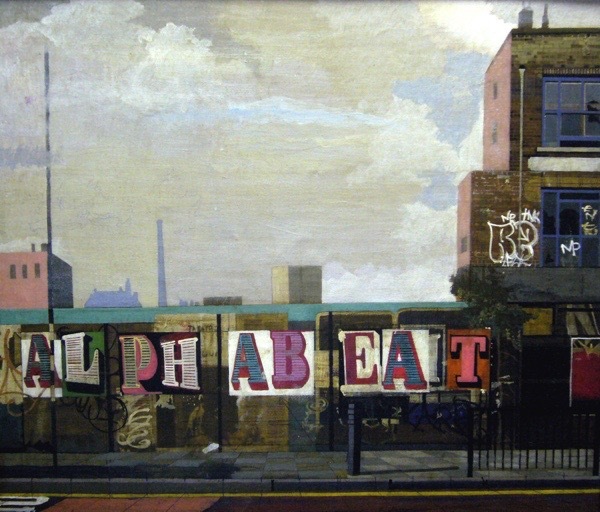 Like so many in your series, he captures the essence of the area. In exile in the middle of the Irish sea, I really appreciate the profiles and look forward to the book. I Iove the high rise and the canal paintings. I know what James means about the hinterlands. Wonderful paintings. I can’t believe they are not being snapped up. GA – “The seductive sense of atmosphere and magical sense of possibility in these pictures is matched by the breathtaking accomplishment of their painterly execution to powerful effect.” Very well said. 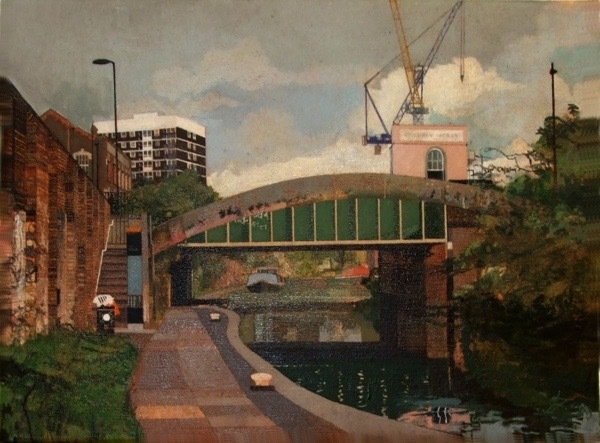 Really enjoyed TWILIGHT AT LONDON FIELDS 2012 and the light in HACKNEY CANAL NEAR MARE STREET 2012. Great work – love his style. Brilliant! It’s a shame that there is no public financial support for gifted artists such as James Mackinnon. But if there were, some of those who scribble on the level of a 6 year old would have to be supported too. I do hope James receives the recognition he deserves. 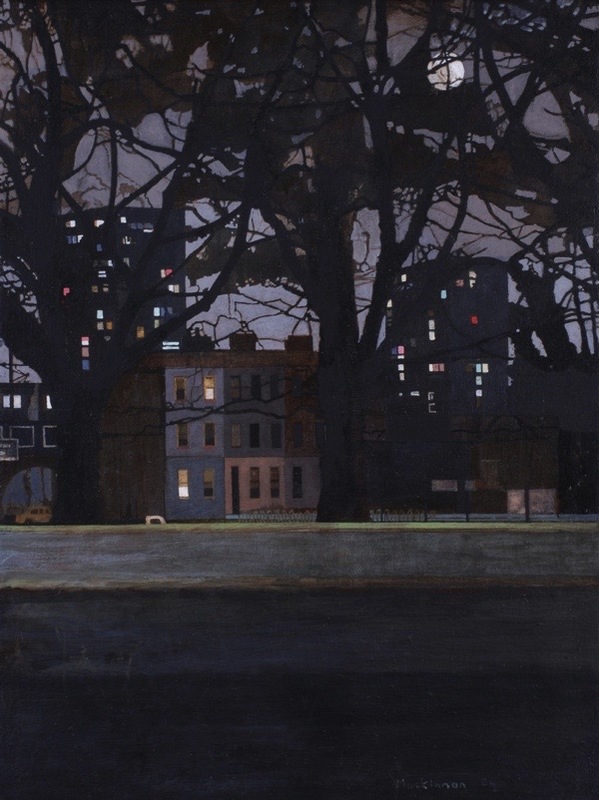 “Hackney Canal near Mare Street,” and his nightscapes, belong in the Tate. Marvellous work. Hastings is a great refuge for painters who have been forced out of the East End by gentrification. His style must find a resonance with the seafront, old shops and fishing boats. Very fine pictures, indeed. Love them! A colourist- a mysterious air surrounds them , the tower blocks remind me of Peter Doug – impressive. Lovely to read this sympathetic article. I’ve known James for years, and love his work. I first met him at the Millinery Works where he had a couple of paintings on show. 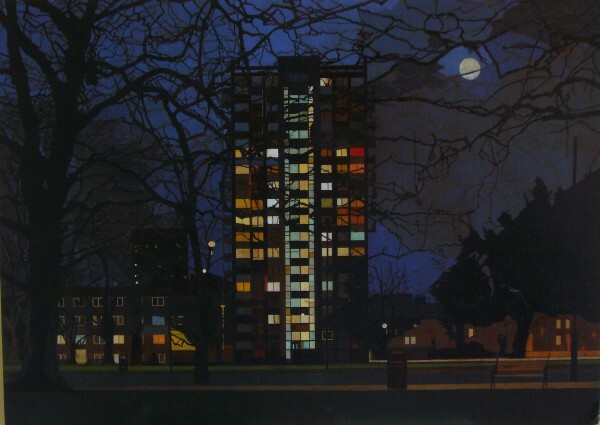 There was one which really stood out for me – a painting of a tower block at night on London Fields. It was its emotional resonance, and a truth about the eery beauty of London, vibrant colour against grey, light in darkness, the seeming anonymity of a place which speaks of the humanity hidden within it. Thank you for sharing this interview and all the wonderful images.